Tonight I sold my first skull on eBay. I have got so many skulls now my room was getting full, so I went through some of the skulls I collected where I had others just like them. The first skull I have sold is a red deer hind skull. It is one that I found late last year at a gamekeepers pit near my house. It is a lovely skull, but I already have lots of skulls like it. I put it on eBay ten days ago with a starting price of just £1.99. For ages no-one put in a bid, then a few days ago I got my first bid. Then in the last day, it kept going up, first to £10.50, then to £15.50, then to £17.50, then finally to £22.90 ! I am not going to sell many skulls, just the ones I have collected where I have others just like them. I am definitely not going to sell my best skulls, and I will never ever sell any skulls given to me as presents. The money I got for the skull I am going to spend on my bone collecting. I haven't decided yet, but I might buy other skulls on eBay, or I might put the money towards a penknife or binoculars for my walks. Hi Jake, just wondering how did you post the skull? 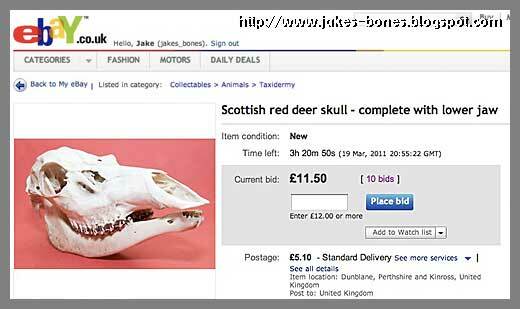 I am interested in selling a few of my skulls on ebay but Royal Mail doesn't allow animal remains. The Royal Mail doesn't allow animal parts - but they don't seem to mind "museum specimens" !